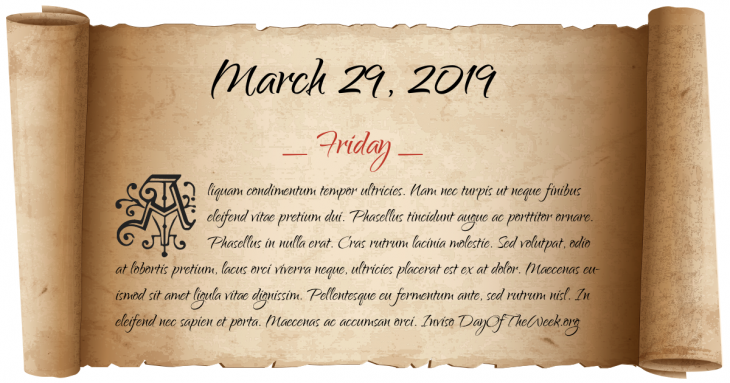 What Day Of The Week Was March 29? Treaty of Saint-Germain is signed returning Quebec to French control after the English had seized it in 1629. King Gustav IV Adolf of Sweden abdicates after a coup d'état. At the Diet of Porvoo, Finland’s four Estates pledge allegiance to Alexander I of Russia, commencing the secession of the Grand Duchy of Finland from Sweden. Sepoy Mangal Pandey of the 34th Regiment, Bengal Native Infantry revolts against the British rule in India and inspires a long-drawn War of Independence of 1857 also known as the Sepoy Mutiny. Dr. John Pemberton brews the first batch of Coca-Cola in a backyard in Atlanta, Georgia. World War II: Last day of V-1 flying bomb attacks on England. A Los Angeles, California jury recommends the death penalty for Charles Manson and three female followers. In reaction to the Passover massacre two days prior, Israel launches Operation Defensive Shield against Palestinian militants, its largest military operation in the West Bank since the 1967 Six-Day War. Who were born on March 29?